The New Zealand Landcare Trust has launched ‘An Inventory of Citizen Science in New Zealand‘ to understand what’s happening in the citizen science space. An Inventory of Citizen Science, which was published earlier this month. The inventory, written by Dr. Monica Peters, includes a range of projects studying everything from children monitoring long-tailed bats, to patrolling beaches for dead seabirds and monitoring local streams. “We wanted to create an inventory to get an overview of what’s happening and bring everything together” says Monica. “There’s a lot going on in the citizen science space but at the moment it’s not well coordinated. The inventory focuses on citizen science projects that monitor environmental restoration projects and shows that scientists and communities are increasingly working together. “Starting with community environmental groups made sense because New Zealand has such a strong grass roots community restoration focus. There are lots of people who want to use science to quantify their restoration and see what impact their hard work has on the environment” says Monica. An example of a toolkit that enables community groups to monitor water quality in streams, lakes and rivers is NIWA’s Stream Health Monitoring and Assessment Kit (SHMAK). This is one of a number of such toolkits specifically designed for community users to measure change in different ecosystems. “It’s important for community groups to have that feedback loop on whether their work is paying off and these toolkits mean people are able to collect information about what impact they are actually having on the ecosystems they’re trying to protect” says Monica. A community group uses NIWA SHMAK kits to monitor a stream in Upper Hutt (Photo by Allan Sheppard). As well as identifying the citizen science projects happening in New Zealand, the inventory makes recommendations to progress the way it is managed and used in the long term. “There’s a growing recognition that scientists and institutions need to work with people on the ground to help gather long-term data” says Monica. And as with many public outreach programmes, there’s a need for long term funding to ensure citizen science projects can be sustained over many years. Community groups also need greater support for environmental monitoring activities such as information and training about best practice methods. As for what happens to the data after it is collected, Monica says we need a strategy that enhances how it is used, including the legal and ethical factors such as determining who owns the data. “Is it the people who are providing it, or is it the organisation or institute who they are providing it to? Getting some transparency and clarity around those types of questions would be useful” says Monica. The inventory is a living document and will be updated when possible. It can be downloaded as a PDF from the Landcare Trust website. 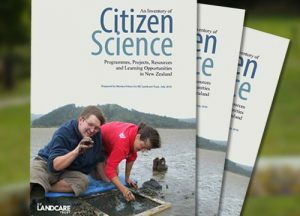 The Citizen Science Inventory was developed as part of the ‘Citizen Science Meets Environmental Restoration‘ project, which hopes to improve the leadership, strategic direction and coordination of citizen science projects in New Zealand. To stay updated with the inventory as it’s updated, you can follow the project on Facebook.